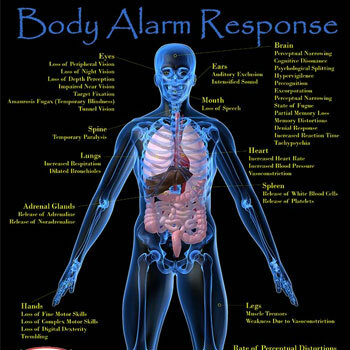 Body Alarm Response (B.A.R. ), or as some like to call it, Adrenal Stress Response, is a reality of most violent encounters. Fortunately, it can can make you stronger, decrease your cognitive processing time, protect you from bleeding too rapidly from cuts and other trauma. Unfortunately, it can also make you do the exact opposite of all of those things if not kept in check! There are a host of physical, psychological, and perceptual distortions that can occur that you need to be prepared for. While it is beyond the scope of these reports to go into extensive detail. We do want to explore some of the most obvious ones. Let’s start by looking at how heart rate impacts performance under stress. As heart rate rises, it will (at first at least) improve some skills. These are primarily gross motor movements. Once the heart rate reaches about 115, you will notice that the adrenaline and noradrenaline dump into the bloodstream can improve your strength and gross motor flailing strikes. Sadly, those with little training seem to get better while those who are more “trained” tend to perform worse. How? Well, those with higher levels of training will often use more fine motor movements. How do these hold up to stress? Not well. As heart rate increases, fine motor skills deteriorate rather rapidly. This means that if you intend to use them at all, it had better be sooner rather than later! Once you feel the adrenaline hit, it is basically too late! Fine Motor – This is any movement involving the fingers and/or toes. Think small joints. Gross Motor – These are movements that involve the whole arm or leg. Think large limbs. Complex Motor – These are movements where arms or legs are doing entirely different things at the same time. Think simultaneous block and strike with arms moving in different directions doing different actions. By the time heart rate reaches around 145, complex motor skills are becoming inceasingly difficult to perform! At a heart rate of 175, things rapidly deteriorate in the cognitive processing realm and defending becomes increasingly difficult! And remember that heart rates of 220 in a real life-and-death struggle are not unheard of! Of course, you have to remember that stress is a perception. Not everyone perceives stress in the same manner. What would scare one person speechless, hardly affects another. It is all based on how you perceive your level of danger and your ability to handle it. Let’s look at the case of an individual who has extensive experience dealing with gang members, killers, and such, in prison working as a guard. Seeing these aggressive people everyday and having to deal with them would elicit less stress from them than the average person on the street. Imagine a rookie’s first time dealing with this and then imagine going back and seeing the same rookie years later. Would you expect his/her stress resposne to be lower? I would. Perhaps you have heard about the research where students were exposed to disturbing images during a college course and their heart rate and blood pressure was monitored. In the beginning, everyone’s levels spiked! But, by the end of the course, some students showed almost no response at all to the same stimulus after being subjected to it every class! This is amazing! So, the basic take-away from this is that the more realistic our training, the less “aroused” we will likely become to violence. Ask yourself, “Am I training so in role-playing scenarios that mimic real life aggression? Or, am I doing static practice with a freindly, smiling partner?” I think you know which will better prepare you for real life! While you are at it, ask yourself “Do my techniques rely upon Fine Motor Skills, Complex Motor Skills, or Gross Motor Skills?” If you do an honest inventory, you may be surprised! The first steps in CombatiXâ„¢ training is to trim the proverbial “fat” from what you do. Please understand I am not suggesting you drop your traditional Martial Arts training. Far from it. Just understand that there is a time and place for everything. If you are in a controlling situation where stress is low and you get to move first, the deteriments of stress are not necessarily yet debilitating. If, however, you find yourself in the middle of a struggle and your heart rate is spiking rapidly, it may be best to rethink what you have previously been taught. For a detailed listing of the effects on your body, check out our poster on the topic. The next stress response we will consider is what happens to the eyes and ears during stress. In the Bubishi, the old Okinawan text that was handed down from master to his most prized student, there is a seciton known as the Kempo Gokui. These are principles of combat. One is roughly translated as “the eye must see all sides.” Another translates as “the ear must listen in all directions.” Practitioners of Isshin-ryu Karate may recognize this is the Isshinryu Code. Look at the Bubishi and you will see where founder Tatsuo Shimabuku got it. that it was important to remind the student to try to keep their eyes focused and alert and their ears hearing sounds from all directions. Sounds simple, but in reality it is very hard! Under stress, one fixates on the source of stress. The one individual who is initiating the stress will receive the focus of the eyes and ears. Changes in the shape of the eye structure under stress along with this target fixation, will lead to a condition known as tunnel vision. Tunnel Vision is like looking through the cardboard roll that is at the center of a roll of paper towels. All you see is a small area. I have personally experienced this one, along with most all of the B.A.R. effects in my lifetime. I can tell you that it is very real! A student of mine was held at gunpoint once by a robber and he swears he saw the details of the bullet while looking down the barrel of the handgun! That is tunnel vision. The problem is that in under stress, the brain is receiving so many signals from the environment that it simply cannot process them all at once. It is sensory overload! So, the brain has to ignore some of these signals. People and objects around the threat are ignored so that the brain can gather as much information as it can on what it believes to be the real threat. The problem is that this other stimuli is often equally important. In these scenarios, it is not uncommon to have individuals miss the friends of the person they are fixating on, stepping up to his/her aid in the situation. Afterwards, they will state they never saw anyone else. And they are right! In like manner, the ears will exclude sounds that are not coming directly from the perceived threat. This means that others shouting at them nearby and giving them challenges or orders will often go unheard provoking more hostility. And the steps of these aggressors will never be heard, nor will their words! This is called auditory exclusion. Now imagine a scenario where a Law Enforcement officer is giving challenges to you in a heated situation, and your imagination will lead you to some very bad scenarios where they think you are being defiant or unresponsive. Not good! As if all of this is not bad enough, near vision is also often very difficult as eyes adjust to fixate on perceived threats some distance off. If you are using a firearm, imagine how difficult sighting your weapon becomes in these circumstances!